On October 24 at the Walpole Library, Zheutlin presented his story of adopting Albie and researching his two books. He was joined by Forever Home Rescue New England Director Joanne Wilkinson, and four of the shelter’s dogs available for adoption. Lizzy, Frank, and Lucy from Forever Home Rescue New England greet Walpole Library visitors. “Rescue Road” documents Zheutlin’s travels in the South with Greg Mahle, saving dogs in high-kill shelters and transporting them to safer shelters. His other book, “Rescued,” tells the story of his own rescue dog, and dives into the stories of others’ experiences with rescue dog adoptions. 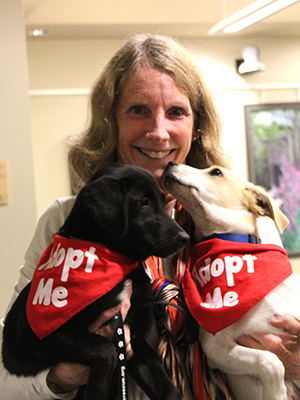 Puppies, Lucy and Frank, show their love for Forever Home Rescue New England director, Joanna Wilkinson, after meeting prospective adopters. As the talk lured dog lovers to the library to listen to Zheutlin’s story, Joanne Wilkinson concluded that the event would be the perfect way to spread awareness about some of the local dogs in need of a forever home. 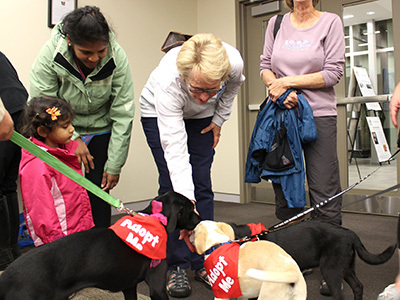 As four dogs wearing red bandanas that said “Adopt Me” greeted each dog enthusiast who entered the Community Room, Wilkinson happily announced that since the shelter’s establishment in March 2008, the Medfield-based shelter has had over 5,300 adoptions. However, there are still many dogs in need. Zheutlin revealed that over 700,000 dogs are euthanized each year. Now the owner of three rescue dogs, Zheutlin expressed the joy and unconditional love that owning a dog brings, while communicating the message: adopt, don’t shop.